Annie Tempest is one of the most beloved cartoonists in the U.K. Among her earlier comic strips were "Westenders" and "The Yuppies." 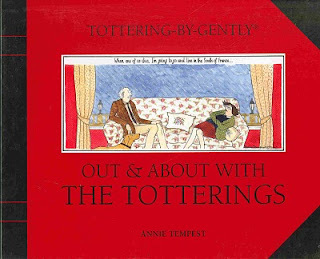 For the past 17 years, she's been chronicling the lives of the Tottering family in "Tottering-by-Gently," which runs in the magazine Country Life. The strips from Country Life have been gathered and are being released in book form. The most recent one is called Out & About with the Totterings. The strips in this book ran between January 2004 and December 2005. We meet the main characters, Dicky and Daffy Tottering, who live in their gently crumbling manor house Tottering Hall in the county of North Pimmshire. They are joined in their activities by daughter Serena, grandchildren Daisy and Freddy and dogs Slobber and Scribble. Also making a frequent appearance is the cleaning lady Mrs. Shagpile (who gives Daffy a run for her money in the smoking competition). The book itself is wonderful -- very sturdy and beautifully constructed. The pages are glossy and colorful, with one strip per page. At the bottom of each page we also have a miniature of Dicky on a scooter or Daffy jogging (which is rather amusing, as Daffy seems to enjoy spending an awful lot of time on the sofa drinking wine rather than exercising!). The strips are full of gentle humor and nice touches. 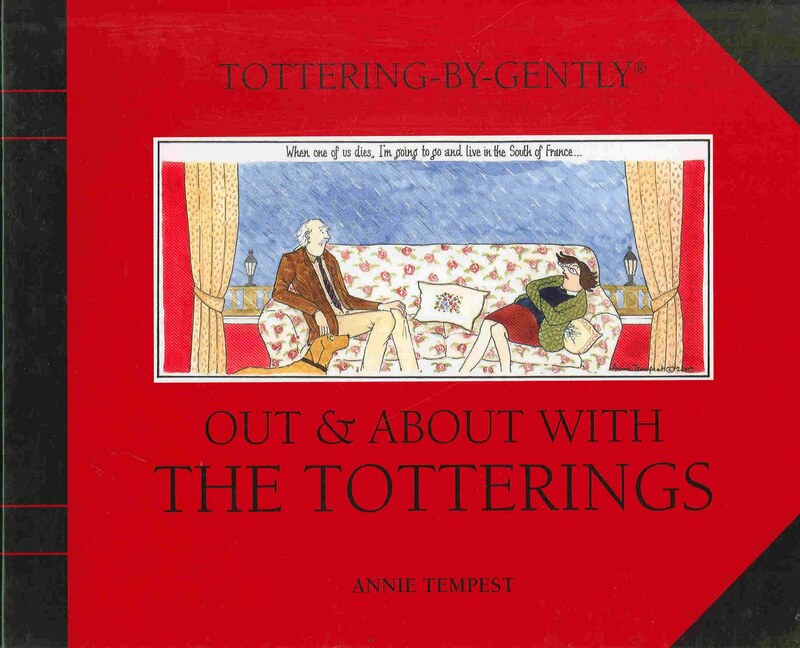 The Totterings are teased by their children about their advanced age and old fashioned ideas. Daffy is continually exasperated by Dicky's expressions of affection toward Slobber. The family goes about life on their country estate engaged in the pursuits of shooting, gardening, country walking and dining out. You can feel the gentle affection among the characters. This was my first introduction to the Totterings, but I'm definitely going to be seeking out more of their adventures in the future! I received a review copy of Out & About with the Totterings from Jennifer at 45th Parallel Communications.